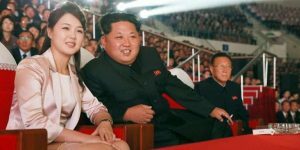 Kim Jong-Un has continued the celebrations of his ruling Workers’ Party’s 70th anniversary with a concert by North Korea’s most popular girl band – and even posed for pictures surrounded by the young women. Kim Jong-Un, 32, and his wife, Ri Sol-ju, believed to be in her late 20s, can be seen surrounded by members of the Moranbong Band, an all-female group reportedly the most popular in North Korea. In another photo, the rotund ‘Dear Leader’, appears to be enjoying himself, as he laughs and enjoys a crafty cigarette while sitting next to his young wife, who wore a pale pink satin jacket and matching skirt. This entry was posted in DPRK Government, Kim Jong Un, Ri Sol Ju by Grant Montgomery.